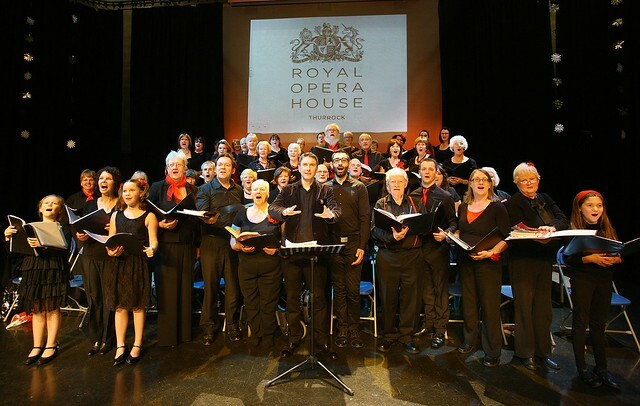 Earlier this month the Royal Opera House Thurrock Community Chorus gave their Christmas concert at the Ellis Theatre in Thurrock. The Chorus has been together for just seven months and is made up of members from the area around the Royal Opera House’s production workshop. Our youngest member is eight and our oldest member is in her 80s. No auditions are held and anyone with an interest in music and singing is welcome. The range of ability is diverse with some members being extremely proficient singers, and others having no prior experience. Repertoire mixes opera as well as contemporary and choral works. At the group’s debut public performance on Sunday 11 December the Chorus performed a wonderful selection of pieces including a rousing chorus from Verdi's Il Trovatore and a moving piece from Purcell's Dido and Aeneas. They also performed extracts from Menizotti's Amahl to a very receptive audience - the title role was sung by two of our youngest Chorus members, Ashley (10) and Blaise (9). Two soloists, Andrew Rees and Nicola Wydenbach, sang a lively duet as well as extracts from Donizetti's Lucia di Lammermoor, Mozart's Idomeneo and the famous Brindisi from Verdi's La traviata. The climax saw an audience singalong of popular Christmas carols followed by mulled wine and mince pies. We are actively seeking to increase our membership and are anticipating an exciting programme of events for the coming year. This will not just include some fabulous concerts, one of which will take place in Covent Garden, but also training and skills development for all singers. Newcomers will be able to get help with reading music, breathing and singing technique and more experienced singers will get the opportunity to develop their technique. An opening evening will be held on 9 January 2012. Please email getinvolved@roh.org.uk or phone 01708 981200 to find out more. Thanks Cathy I hope you are inspired! Please check back soon for future performances with the Chorus.